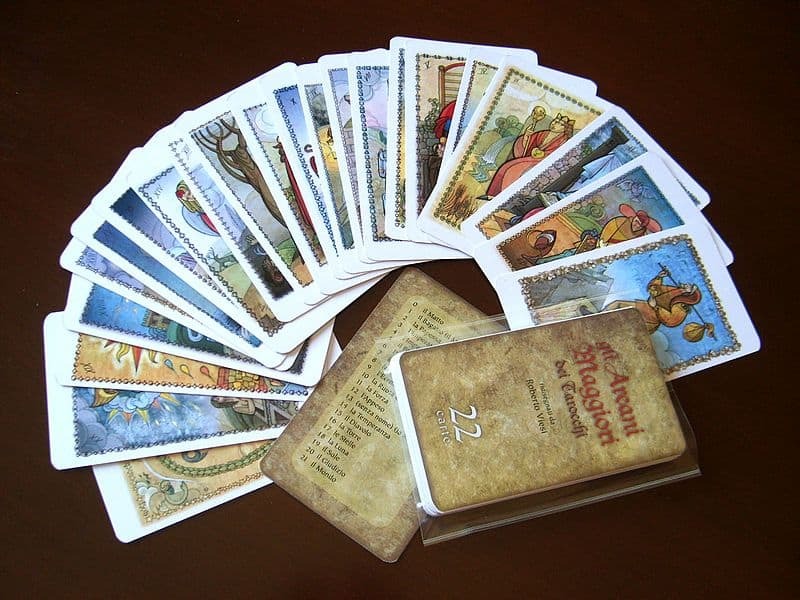 Tarot Decks are cards with rich visual imagery with a clear message to spark your intuition. Tarot offers a source of easily accessed information, which can guide your decisions and support your path. Often, the message of the card will be very clear. Tarot cards can offer a method of glimpsing into the future to gain guidance. The artwork on the hundreds of different tarot decks is often inspiring, and simply meditating on the imagery offers a profound message. When we can pull out a card, and it confirms our decision, we are confident to move forward. Tarot reading is a time honored skill, requiring patience to become proficient. Some people chose to become students of the cards, devoting years to the path of mastery. However, this serious endevour is not necessary to gain the insight you need, and blessings tarot can offer. In the last century, Tarot Cards have become readily available; simply gazing into a card can unlock your intuition. Beyond words, the art itself imparts the teaching of the card. Tarot cards are a spiritual tool, offering a means to connect with inner guidance. Many times, we have an intuition, but are uncertain whether to follow. The cards can act as an affirmation from Spirit to move forward, or, to reconsider your idea. Most of the time, the tarot will reaffirm what you already know. Quite simply, the tarot cards can give us the courage to act, and trust our intuition. The perfect deck need not be found, it will find you! Don’t be too analytical, instead, feel which deck calls to you. The imagery may linger in your mind, or you may have a dream which guides you to the right deck. Check your local bookstore, or search through Amazon’s massive collection. Don’t be in a rush, let your heart feel which is the right deck for you. And remember, you can always buy more than one! You will use your tarot deck with love and respect, and the guidance will flow to you. But before you jump in, it’s a good idea to prepare your deck, to resonate with you. It is always a good idea to cleanse your new deck. You may clear it as you would crystals, with smoke, sound, or a full moon bath. You may sleep with your Tarot cards under your pillow, carry them with you in your bag or purse, or keep them into your meditation or yoga space. You can pray, chant or sing over your tarot cards, so the vibrations bring the energy of the cards to your personal frequency. Before you start using the cards, be clear about what your intention is. This is a good practice for any spiritual endevour, but can be especially helpful when initiating a new tarot deck. Ask a Question! The joy of the tarot is when you ask a question, you will generally get a clear answer. Just ask a question, and pull a card. It’s amazing how the right card will appear to answer your concerns, and ease your mind. The purpose of divination is to get information about the future. A three card reading will offer you guidance on the past, present and future, regarding the question. You can also use these 3 cards as: the shadow (or underlying influence of the situation), where you are currently, and what the outcome (or necessary steps forward) should be. Often, you may not be seeking any concrete answers, but just need a little support emotional support. You can pull a tarot card with the simple intention of “what guidance will serve me best right now.” The ways the cards can offer support can be enlightening! The tarot is not magic, but rather, it offers a channel to developing your soul. Be optimistic, and don’t expect the tarot to fix all your problems. It is your higher self, communicating to you through the tarot. If you can follow the guidance the tarot has to offer, you will find the space within yourself to be successful. If the cards aren’t “working”, try cleansing them, or allow yourself to be still a bit longer. If you find the images challenging, step back, and see what your eyes are drawn to. Where intention flows, energy goes. You may receive more messages from what you notice, than any traditional meaning. While we should never put our trust in anything outside ourselves, tarot cards often will give us the encouragement to follow our own intuition. While the cards are just pieces of paper, tarot can offer us a feeling of inspiration, certainty and love. They can be a subtle reminder that we are not alone. You can use your cards as a solitary means of guidance, or you can begin reading for others, and spread the love!